While a large number of galleries close during the holiday season, others seize the opportunity to put on outstanding summer shows. If you’re the kind of traveler that likes to discover more than just beach life, make sure to visit these must-see exhibitions when you’re in town. Founded back in 1971, The Photographer’s Gallery was the very first gallery in the UK solely dedicated to photography. Several decades later, it is still a mandatory stop for fans of the genre. Now located in a former textiles warehouse in Soho, it not only features a large-scale exhibition space but also a café, bookshop and educational facilities. 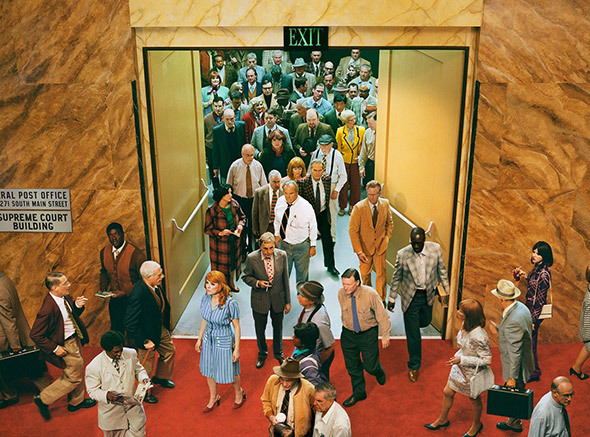 While it’s always worth a visit, it’s even more so this summer, when the gallery plays host to »Silver Lake Drive«, the first career survey of American photographer Alex Prager. Effortlessly alternating between film and photography, she is known for her cinematic, stylized and emotionally loaded images that are clearly inspired by an old Hollywood aesthetic. Using highly saturated colors to dramatic effect, Prager depicts elaborately staged scenes with perturbing, eerie, and unsettling undertones, a distinctive visual style oftentimes reminiscent of Hitchcock. The exhibition, stretching across two gallery floors, brings together photographs from the last decade as well as the artist’s complete film works. It of course includes her celebrated Crowd series, a logistically ambitious project picturing large groups of people at the beach or at an airport while zooming in on their individual stories, conveying a strong sense of isolation despite being closely surrounded. 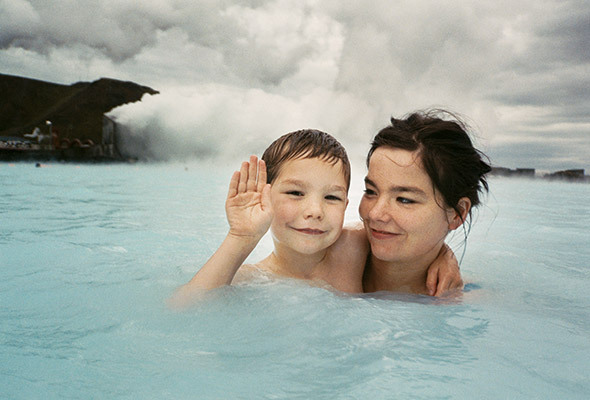 Juergen Teller is undoubtedly one of the major stars in contemporary photography today, and rightly so: No one else manages to show celebrities so surprisingly raw and real, achieving a rarely seen intimacy with his subjects by using absurd, unexpected, even unflattering image constructions. Having studied photography in Munich, he moved to London to shoot for music and fashion magazines. One of his first noted projects was the visual documentation of Nirvana’s release tour, before the band gained cult status. Although since then he has had almost all the rich and famous in front of his lens, he rejects the usual polished glamour shoots, going for something more playful, unpredictable, and daring. Teller shows actress Charlotte Rampling naked at the piano, Björk swimming with her son in Iceland’s Blue Lagoon, supermodel Kate Moss sleepy and makeup free in bed, Claudia Schiffer with smudged mascara and a soggy cigarette, and Vivienne Westwood eating a banana. Interestingly, »Enjoy Your Life« at Photography Museum Winterthur focuses on much more than just celebrity shoots: A room whose wall is graced with the telling word “Melancholia” assembles more personal works of Teller which reveal a different side of the German star photographer, including a selection of powerful self-portraits. 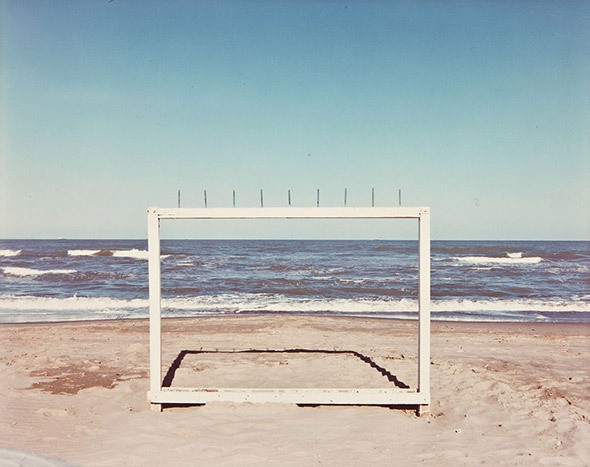 Luigi Ghirri, who died in 1992, is widely known as a pioneer of European color photography and for his conceptual photography approach. With »The Map and the Territory«, Essen’s Folkwang Museum dedicates an extensive exhibition to the renowned artist, the first wide-ranging museum show outside of his native Italy, which incidentally he represented at the Venice Biennale in 2011. The show brings together around 300 photographs subdivided into 15 thematic groups, revealing the broad range of subjects Ghirri addressed. The focus lies on his work from the 70s, his most productive decade. He primarily directed his lens at the landscapes and environments that surrounded him, picturing gardens, monuments, buildings and more with a powerful simplicity that demonstrated his exceptional eye for scale, shape, space, and light. Most striking though is his chromatic style that championed soft, washed-out colors, evoking a dreamy, nostalgic atmosphere. Interestingly, he often combined poetry with unusual perspectives, adding a dash of humor into the mix. »I didn't want to create photographs, but maps, plans, that at the same time were meant to be photographs,« the artist once said. This one is an absolute must for those who like talent watching and keeping up-to-date with current trends and new ideas in photography and photo-based art. New York’s MoMA has devoted a show to photography’s rising stars and developments every two years since 1985. This year’s theme, under the title »Being«, evolves around the question of how photography can capture what it means to be human and gathers an international group of 17 artists at various stages in their careers and on view at the esteemed museum for the very first time. The selected photographers from the US, Brazil, India, Ethiopia, Italy, Poland, Germany, and the Philippines, each in their own way explore humanity and its diversity, identity, gender, heritage, and the representation of personhood, often challenging conventional portraiture. As part of this year’s PHotoEspaña, an international festival of photography and visual arts in Madrid, the stunning water tower-turned-gallery-space Sala Canal Isabel presents a large-scale retrospective of Spanish artist Ricardo Cases. The exhibition title »An Elemental Study of the Levante« refers to the eastern region of the Iberian Peninsula on the Spanish Mediterranean coast. »Levante« usually encompasses the Valencian Community, Murcia, Almería, the Balearics, and the coast of Catalonia. The region has been Cases’ preferred photographic playground since his move to Valencia in 2010, providing a distinctive backdrop for his compelling oeuvre, which offers a poetic investigation of the local culture, landscape, and environment. A perfect example of Cases’ approach is the Pigeons in Flight series, his international breakthrough. Along the east coast of Spain, groups of men can be found taking part in pigeon racing, a pastime dating back to the late 18th century. 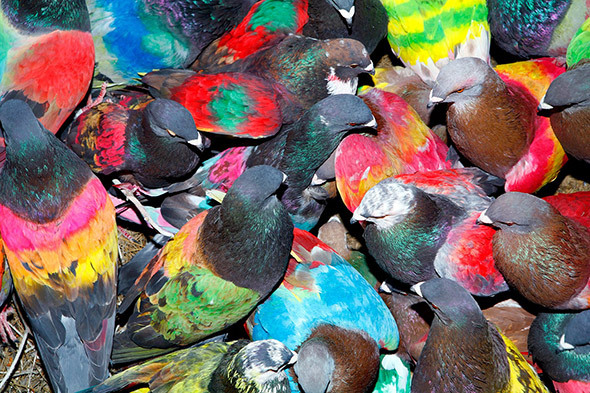 Before the start of the race, participants paint their birds in bright colors to be able to keep track of them. The winner is the bird that spends the most time close to the only female bird sent into the race. Cases captivates with his documentation of this eccentric tradition without judgment or sentimentality. 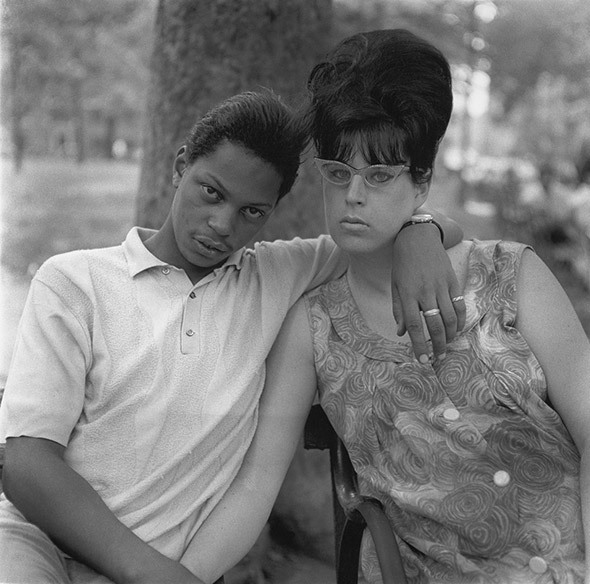 »Real Worlds« at Los Angeles’ MOCA provides an extraordinary opportunity to discover three legendary photographers at once, all of whom have had a significant impact on the development of the genre as a whole: Brassaï, Diane Arbus, and Nan Goldin. Born between 1899 and 1953, each one made a name for themselves with social documentary photography, shining a light on the more marginal aspects of modern life, from 1930s Paris to 1980s New York. The 100 images exhibited include Brassaï’s memorable black-and-white depiction of pre-war Parisian nightlife, its partygoers, prostitutes, and club owners, as well as Arbus’ poignant, intense portraits of social outsiders. The selection is completed by the powerful and profoundly personal work of Nan Goldin, who for instance captured the queer community during the growing AIDS epidemic of the 80s, often intimately chronicling the relationships between friends, family, and lovers, whom Goldin calls her »tribe«. A deeply touching show full of humanity and honesty. While Mark Shaw is best known as the unofficial home photographer of the Kennedy family, this exhibition at Galerie MR14 is dedicated to his fashion work in France. 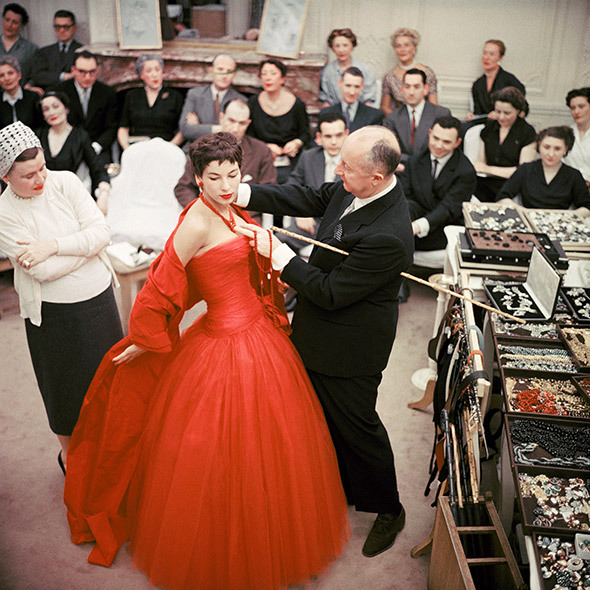 Coinciding with the 70th anniversary of Dior, »Paris Haute Couture« offers a unique glimpse into the French capital’s fashion world of the 50s, featuring runway shows, backstage moments as well as the goings-on in legendary fashion houses such as Balmain, Dior, and Balenciaga. 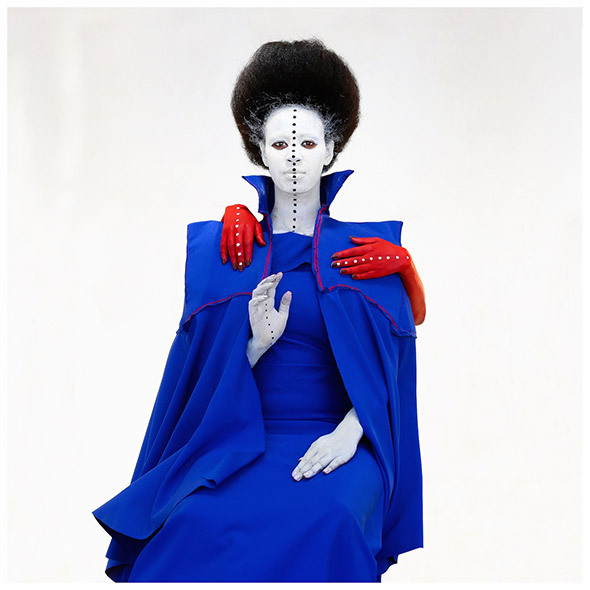 The exhibition consists of 50 fascinating images by the American photographer, taking the viewer on an exciting journey through the golden age of haute couture. Remarkably, Shaw was one of the first photographers in history to use color photography when shooting runways. He not only became one of the leading fashion photographers of his time but also got the era’s stars and celebrities in front of his lens, from Elizabeth Taylor and Audrey Hepburn to Pablo Picasso and Cary Grant. It’s no coincidence that his alluring shots have graced the cover of iconic Life magazine no less than 27 times.